Time has an article about the latest campaign for promoting iGoogle using chic themes. Google tries to attract more users to the future social network and the new themes are a good opportunity to make people aware that Google's homepage can be more than just a simple logo, a search box and a bunch of links. But iGoogle can be much more than a potential alternative to Facebook and other social networks: iGoogle users are more likely to have a Google account and use other Google services. Even if Google always says that users can customize the homepage with their favorite feeds and gadgets, it's much easier to find gadgets for Google's services than for Yahoo or Microsoft. iGoogle users are also more likely to visit Google's homepage and even to set iGoogle as the browser's homepage. A Google spokesman told Time.com that "iGoogle currently accounts for 20 percent of visits to Google's home page", which is a lot if we take into account the number of unique visitors from November as measured by comScore: 500 million users for Google Search vs 22.5 million users for iGoogle. If these numbers are accurate, we could say that 5% of the users account for 20% of visits. And the great thing is that, after clicking on the iGoogle link, Google sets a cookie preference so that all visits to google.com will be redirected to iGoogle. Of course, people can always reset the preference by clicking on "Classic Google", but probably few notice the link. 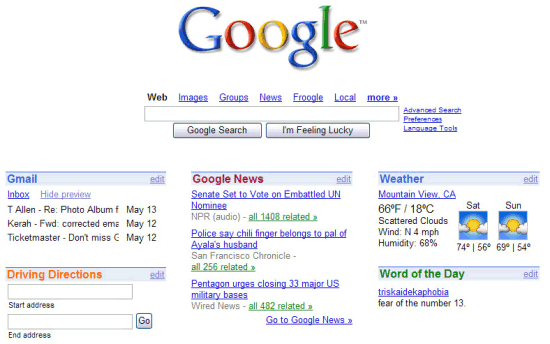 The classic homepage will probably remain an option for all those who want a simple interface and iGoogle will slowly become the default Google homepage. "The personalized homepage is a complement to the existing Google homepage - not a replacement. 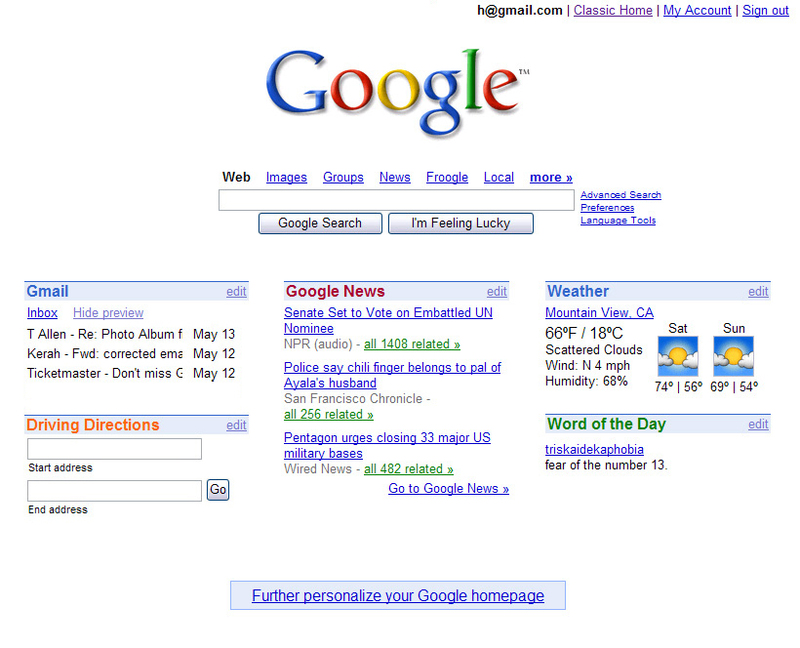 Keep using the original Google homepage if you want to. (We expect many people will.) But if you're keen to organize and customize your information, take a stab at designing your own homepage," explained Marissa Mayer in May 2005, when iGoogle was launched. The service has changed a lot since then and now is about to become the place were you collect, organize and share your online information. Igoogle is good but my work has just blocked it (we use one of the big web filter systems so I guess this will go pretty universal soon). Still use it at home. iGoogle is a Trojan horse for upcoming social applications. When you think a little before adding new features and gadgets to iGoogle it is very useful. I have designed my iGoogle in such a way that it helps me keep track of my personal life aswell as for my business life. With the tabs it stays organized and saves me a lot of time. igoogle needs to catch up with netvibes. I prefer igoogle because of its speed, but it is lacking in features compared to netvibes. igoogle is a perfect place for working with high quality. how do u add igoogle as your homepage?? iGoogle isn't going to stand being in second place to facebook long. This is the beginning to the end of most social media platforms. iGoogle will never replace social media sites such as Facebook. It doesn't offer anywhere near the same level of functionality and usability, and lacks a huge part of the interaction that sites such as Facebook are used for. If anything, social networking sites will hurt Google's marketing share as people will find the information that they need from links posted by their friends as opposed to the Google search bar. iGoogle is nice but for some reason I stopped using it. Got hooked with facebook I guess. OMG! This is the first time I've heard of this...2 years later..
From the looks of the video, it seems pretty cool although the original homepage of Google has everything I need and them some. I'm going to give it a try anyway. Thanks!